You can even see the skipole on the summit! I was wondering about the colour of your series, did you use Kodachrome, or is it your scanner that creates the (quite nice!) blueish tones? 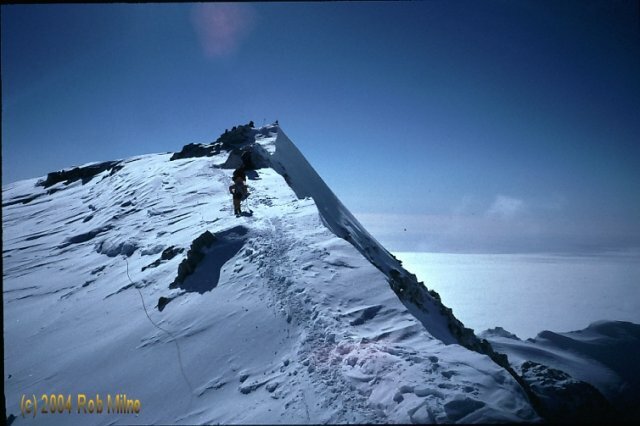 I noticed the same effect when shooting [URL=http://7summits.com/images/categories.php?cat_id=5]Denali on Kodachrome 64 [/URL] last year. I used Kodachrome 64. My guess is that the scanner image correction software has picked out the blue. I'm glad you like them. Most of these are views I had not seen elsewhere. It was even more fun to take the photos! When I scanned my Kodachrome64, I had to correct the color extremely: maximum move to red before I got the colours back that I could see on the slides with my own eyes. This is even so when using the 'kodachrome' preset on my HP PhotoSmart s20.. Anyway, thanks for sharing the great pix, Rob!